My HP runs Windows Vista, I got it in 2007 and that was the available Windows OS at the time. 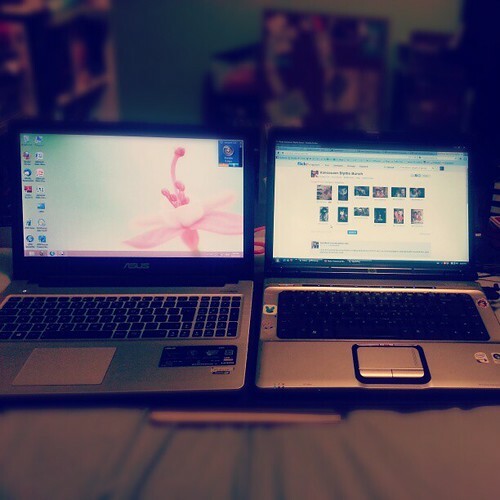 The one the left is my new baby, an Asus ultrabook running Windows 8. For some reason, I was (and still am) the only person in my family with a computer running Vista. Now I’m the only one running Win 8. Everyone else has a different OS than me (one sister has XP, the other sister and my dad run Windows 7 on their laptops, the desktops run XP). I never had the issues that people had with Windows Vista. I really didn’t. I ran programs that were available for Vista, I had enough memory to handle the resource hog. I just never had the issues that everyone else seemed to have. After all, the most memory intensive thing that I do is run Photoshop. Other programs I run are Office (Word, Excel, Powerpoint) and then the internet, email and messaging programs. It’s not like I’m running several resources hogs at one go. And then there’s Windows 8. My new laptop is not a touch screen so I’m not actually that found of their start menu. I’m also not fond of the fact that they hid the shut down options. The start button was removed, they have a weird blocky colourful menu instead and it takes several mouse swipes to get to the shut down options (charm menu > settings > power > shut down). Why it’s under settings, I don’t know. I’m also not fond of the charm menu and I prefer staying on my desktop at all times, which was difficult because it’s hard to actually find programs unless you’re on the stupid start menu. So Clay turned me onto the idea of downloading a start button and it works. I can easily access my regular options (including shutting things down….) and I can get to my programs list a lot easier, as well as the control panel. All in all, ‘reverting’ Windows 8 to look more familiar to me is the good way to go. At least it makes finding things a lot easier for me! Like you, I have Windows 8 installed on non-touchscreen PCs (my laptop and my desktop), and while I like the block/grid style of the new Start Menu (mostly), it isn’t really all that practical. I’m annoyed with how shutting down is like a five step process (start, hover to right to get user pic, sign out, wait for welcome screen, then select shut down from the bottom right menu), so I tweaked the Power Options (in Control Panel – or just search for “Power Options”) to make my laptop and desktop’s power buttons the shutdown buttons as well. Oooh thanks for the tip. I just built my new PC and bought windows 8 on it because it was cheap, and I heard other than the weird interface it was pretty good. Definitely going to download a start button sometime. I used ninite! Clay told me about it and it’s basically a big installer. You choose whatever programs you want and it automatically goes through the installation process (and says no to all those extra things like Bing/Ask Jeeves toolbars). Super useful. Oh how exciting!! Thats awesome!! Are you liking Windows 8 so far?? 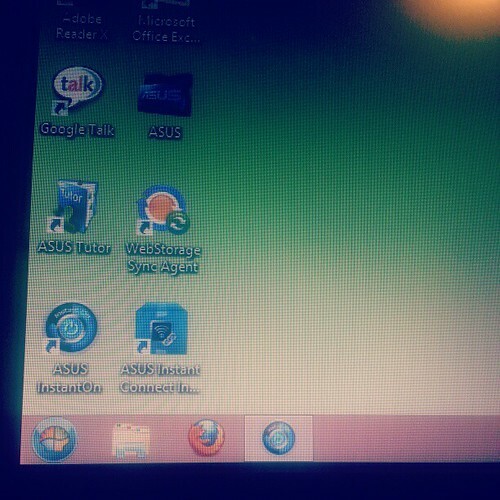 I just have Windows 7 on this PC and I think I have Vista on my laptop (I dont remember, I barely use it). My estimated due date is September 3rd! 🙂 it is so terribly exciting! I hated the new interface of W8 when I first tried it as well but I’m a firm believer in giving something at least 2 weeks so I get accustomed prior to making a decision. I hated not having a start button when I first got W8 but now I don’t mind it at all, lol. The shut down thing is not a big deal for me because I don’t really shut down my computer (it goes into sleep mode) but I can definitely understand why people dislike it.